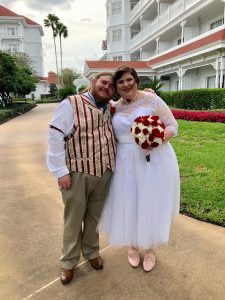 Ashley and Sei’ne’s dream of having a Sago Cay wedding at Walt Disney World came true this week. Dressed in their dapper attire Sei’ne took his place along the canal at Sago Cay, right behing the Grand Floridian Resort. Moments later with Rob playing violin music, Ashley took her walk down the aisle to her happily ever after. Steffane with Disney Fairytale Weddings coordinated the intimate wedding ceremony. Both Ashely and Sei’ne both asked friends to join their celebration. I’ll never forget Sei’ne’s first trip to Disney World. In just a few months, I would be graduating from Radford University, and in lieu of cash gifts from well-wishers I had asked if I could take Sei’ne to Orlando for a week over spring break. Throughout our relationship, Sei’ne had become all-too familiar with my love of Disney, especially the parks, but I think he still wasn’t sure what to expect as we drove through the Carolinas on I-77. I had described Disney World as “perfect,” and “magical,” but back in those early years Sei’ne struggled to believe in magic, and certainly very little in his life had been perfect. Between sleeping in at our hotel in South Carolina and spring break traffic, we didn’t get checked in to our little room at All Star Movies until late afternoon. By the time we had dumped our bags and boarded a bus for the Magic Kingdom, the blue of twilight had settled over Orlando. There were no other passengers. I started to worry. Would we have much time in the parks that day? Would a few hours be enough to convince Sei’ne that this place was everything I said it was? He gave me a strange look when Cinderella’s castle came into view and I started to cry. Maybe he wouldn’t understand after all. He waded through the long entrance lines with a few grumbled complaints, but Sei’ne has always had saint-levels of patience, especially for me. Finally, we were inside. Sei’ne studied Main Street with a critical eye. We held hands and walked along turn-of-the-century shops without saying much. Then, one by one, the lights along Main Street clicked on, bathing the streets in a warm, amber glow. Sei’ne’s grip on my hand tightened. Without another word, we started to run down the street towards the castle, then straight on to Fantasy Land. We laughed. We sang along with the music and danced while waiting in line. I even got him to ride it’s a small world — a feat I had thought previously impossible. It was in those few hours that Sei’ne became a different person to me. The fear and resignation he had about the future melted away and we lived in the moment, like two children happily lost in toyland. And for the first time in a long time, I really think that Sei’ne believed in magic. It’s one of my happiest memories, and in so many ways, that first trip to Disney World serves as a great metaphor for our relationship. Through the years, I have watched Sei’ne shed his doubts and fears and grow into someone braver, kinder, and happier. Our relationship changed and grew stronger, more joyful and serene. It’s not a transformation that came effortlessly — Sei’ne has worked hard for everything he’s achieved, but I really do think that the first step towards change came first from the belief that anything is possible — especially with a little bit of pixie dust. We’re still two children laughing, singing, and dreaming together. I think together, we can achieve really beautiful and wonderful things, and have fun while we’re doing it. Thank you so much for believing, Sei’ne. Thank you so much for the magic. Most of all, thank you so much for being my friend. I love you so much. All of my adventures begin with you. If I had known that a kidney infection would threaten to ruin our first Valentine’s Day for us, I might have dissuaded you from that terrible chicken taco. We didn’t let it keep you down, though. If I had known where to find Eheart Street, we might not have lost your first Beetle in a fight with a Hummer. We had a wild ride, to say the least. If I had known that you were trying to ask me on a date when you were looking for a “friend” to see Ghost Town with you, we might not have labored through the run-time of Blindness. “Arthouse” my foot. If I had known how rotten that shoebox apartment in Radford was going to be, I would have gladly suffered it thrice over just to be nearer to you. I might even still invite Todd and Matt to join me. If I had known how happy getting Jessie Mae would make you, I would have gotten you a whole kennel of ill-behaved dogs already. Not a single one would listen to us, naturally. If I had known better how to communicate how I was feeling during my depression, I might not have given you those stray gray hairs. I still can’t express how sorry I am for that year. If I had known how much fun it is to write stories with you, I would have started years ago. We’d probably have three books done by now — each progressively stranger than the last. If I had known that you would create a whole new character just to torment me, I would have gotten Kier cursed the very first time we played D&D. And you would have gotten to play Apopka Snake Farmer, too. If I had known how fluent you were in Internet, I’d have Giraffed the Twelve Times to Explode Trees. And you can take that to the lake. We wish them happiness for a lifetime. Congratulations!